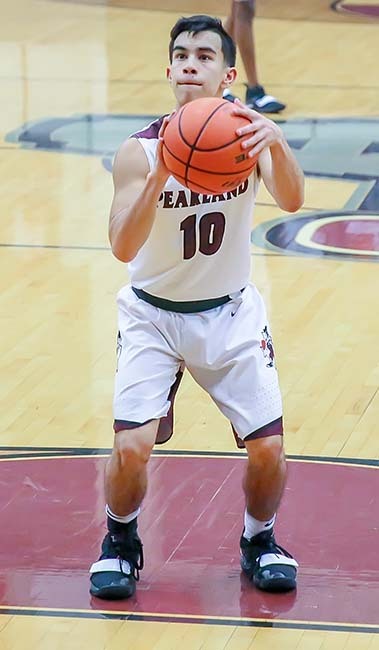 CLUTCH FREE THROWS - Pearland senior Ethan Flores (10) hit 6-of-6 free throws in the final frame against Alief Hastings as the Oilers nipped the Bears 51-48. Two of the free throws came with six seconds remaining in the game to secure the district win. PEARLAND — The Pearland Oilers needed to pick up a district win and they survived a late-game rally by the Alief Hastings Bears to get a 51-48 District 23-6A win to improve to 3-2 in league play while the Bears dropped to 1-4. The game was tight all the way as Pearland opened up the first quarter with a slim 18-17 lead as Javonne Lowery led the way on offense with three field goals for six points. The Oilers outscored the visitors 14-13 in the second period for a 32-30 lead at intermission. The Bears shut down Lowery in the second frame but six other Oilers stepped up to score six baskets and a pair of free throws to maintain the halftime advantage. Neither team was too effective to begin the second half as the Bears moved a point closer 9-8 sending the game into the final eight minutes with the Oilers clinging to a 40-39 lead. Lowery scored six of the eight points for Pearland in the stanza. With 40 seconds left in the fourth quarter, Pearland had built a 49-43 lead, but Hastings was finished as they hit a quick 3-pointer to cut the margin to 49-46 with 32 seconds remaining. After a Pearland turnover, Hastings quickly scored again to narrow the lead to 49-48 with 11 seconds left on the game clock. Pearland got the ball inbounds to Ethan Flores who was quickly fouled with 6 seconds left. The senior guard hit both pressure-packed free throws giving the Oilers a 51-48 lead which stood at the end of the game for a Pearland win. Flores was clutch down the stretch for the Oilers hitting 6-of-6 free throws in the final frame. Lowery finished the game with 14 points to lead the Oilers while Flores, James Guse, and Derrick Ardoin tossed in eight points each. Pearland will travel to George Ranch to face the Longhorns on Friday, January 18 at 7:00 p.m. to close out the first round of 23-6A action.